Sometimes small victories or positive actions are almost as important as major international ones as they can give a new quality of impulse to many related developments, what physicists call the “butterfly effect.” To be more precise, a butterfly effect says that “a small change in one state of a deterministic nonlinear system can result in large differences in a later state,” or that small causes may have large effects. That’s tied to the reality that every part of our Cosmos is interconnected. Such, I believe, will be the “butterfly effect” of a recent decision by the government of China’s northeastern Heilongjiang Province that can give huge impetus to Russia-China trade and economic development and to events far beyond. It’s about building up good natural new structures. On December 16, 2016, the Provincial Heilongjiang Legislature passed a total ban on the growing of Genetically Modified or GMO crops. The ban goes into effect on May 1, 2017, in some five months. Farmers in China’s Heilongjiang province, one of China’s top grain producing regions, will be prohibited from growing GMO crops, according to the provincial regulation just passed. According to the new law, the ban will be on growing of GMO corn, rice and soybeans. Further, illegal production and sales of GMO crops and supply of their seeds will also be prohibited, as will be illegal production, processing, sale and imports of edible GMO farm produce or edible farm products that contain GMO ingredients. Any GMO food can only be sold in a special zone, clearly indicated in stores as GMO food products, a variation on labelling. The legislature acted after a broad survey of the provincial population in October revealed that more than 91% of the population objected to the cultivation of GMO crops. The official ban follows discovery this past September that some 10% of Heilongjiang soybean farmers were illegally planting smuggled GMO soybean seeds despite the fact that the Beijing national government still bans planting of GMO commercial crops, allowing so far only controlled research to be done on GMO “biotechnology.” The farmers had been told, wrongly, that GMO seeds would increase their harvest yields. Farmers found guilty of growing illegal GMO crops face a fine of up to 200,000 yuan or $31,480. In China, owing to a US-promoted loophole in ban on GMO, GMO soybeans as animal feed are allowed in China. Some 60% of all soybeans consumed in China is, as a result of that unfortunate loophole, today GMO. Monsanto and other Western GMO purveyors promote their GMO seeds at agriculture fairs and farmers can buy the seeds online, even though planting is illegal. In August the giant Chinese state chemicals group, ChemChina made a staggering $43 billion bid to acquire the Swiss GMO seeds and agrochemicals group, Syngenta. Recently Chinese President Xi Jinping and his Prime Minister have given very positive statements about the potential of GMO and biotechnology to contribute to the push to make China a high-tech economic actor. The latest decision of the people and legislature in Heilongjiang sends a clear signal opposing that Beijing strategy. The butterfly effect of the Heilongjiang ban on GMO crops will definitely affect future agriculture relations between China and neighboring Russia. Heilongjiang Province has the longest common border with Russia of any province, the two countries’ boundary demarcated by the Amur River. Earlier this year, the Russian Federation’s Duma approved, and President Putin signed a law banning all commercial cultivation of GMO crops in the Russian Federation. The Heilongjiang ban potentially can open up Sino-Russian grain trade on a GMO-free basis, creating new synergies. The Chinese government recently took other steps to vitalize the stagnant economy of Heilongjiang which was under Japanese occupation from 1931 as part of the Japanese puppet state of Manchukuo, until the Soviet Army liberated it in 1945. Since 2009 Heilongjiang has been part of a Beijing program, Northeast China Revitalization. That calls for substantial investment in modernizing industry and developing key economic infrastructure. A road and highway proposal accepted in 2006 is in process. It calls for constructing 38,000 kilometers of new roads, expanding Heilongjiang’s total road network to 2.3 million kilometers. 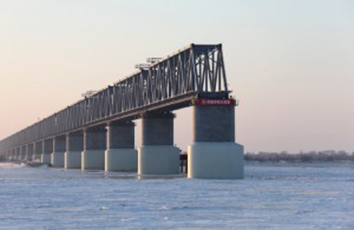 Heilongjiang presently has 60 rail lines of some 5,300 kilometers including a section of the Asia-Europe Continental Bridge. The Harbin–Dalian High-Speed Railway, completed in 2012, runs from Harbin, Heilongjiang’s capital, to Dalian in Liaoning province to the south, bordering on North Korea, via Changchun and Shenyang. It’s planned to carry 37 million passengers per year by 2020. And one of the most promising areas of China-Russian economic cooperation also connects Heilongjiang to Russia’s Jewish Autonomous Oblast, across the long winding Amur River. The project, due to complete in 2018, is known as the Amur Bridge Project. It is under construction with the longer China section complete and the Russian under construction after delays, since July. When open, the bridge will carry two gauges of rail link–one standard gauge used by China of 1435 mm track and a Russian gauge of 1520 mm track. The 2 km long bridge will link Nizhneleninskoye in the Jewish Autonomous Oblast with Tongjiang in Heilongjiang Province. The drive for building the bridge is initially to bring Russian iron ore from Petropavlovsk open-pit mine in Kimkan in Jewish Autonomous Oblast to markets in China. However that bridge will clearly open up vast untapped minerals and other products in that section of Russia long economically neglected by the devastations of the Yeltsin years of the 1990’s. This linking of Heilongjiang in China’s northeast with Russia’s Jewish Autonomous Oblast with its vast mineral riches including gold and very rich agriculture soils, today GMO-free, with China via the Amur Bridge will inevitably link the developing Eurasian Rail and port network of China–One Bridge, One Road–with Russia in that critical economic region. The Trans-Siberian Railway completed in 1914, runs through the Jewish Autonomous Oblast. And in another part of China, it’s just been formally announced that an eight-year-long 2,066 km long High-Speed Rail Corridor, the Shanghai-Kunming Corridor, will open at the end of December, 2016 carrying freight and passengers at speeds of up to 350 Km/hour connecting East, Central and Southwest China. It consists of three sections connecting Shanghai, China’s largest city of some 23 million inhabitants, on its East Coast, with Kunming, a thriving city of almost 7 million near to Vietnam and Thailand. Kunming is a hub in the emerging One Belt, One Road rail-port infrastructure. Good, well-conceived building-up projects have a definite butterfly effect, sending initially small shock waves of positive energy that amplify in time to huge transformations. The recent developments in Heilongjiang Province, combined with the developing infrastructure links cross-crossing Eurasia from China and Russia are beautiful examples of this. 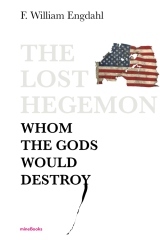 Building up is far more interesting than the kind of tearing down that we in the West seem so pathologically obsessed with, waging NATO wars everywhere.